Description: New aftermarket Acer laptop replacement battery. The specifications for this battery are 5200mAh, 10.8V, 6 Cell. This is a high quality battery. Compatible Part #'s: BT.00605.072, BT.00607.136, BT.00607.137, AS10D73, AS10D75. 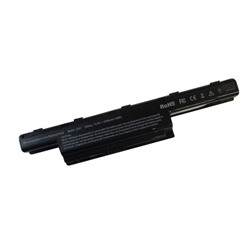 Acer Aspire E1-421, E1-431, E1-471, E1-521, E1-531, E1-571, V3-471, V3-471G, V3-551, V3-551G, V3-571, V3-571G, V3-731, V3-771, V3-771G. Acer TravelMate 6495, 6495T, 6495TG, 6595, 6595G, 6595T, 6595TG, 8473T, 8473TG, 8573, 8573T, 8573TG, P243-M, P243-MG, P453-M, P453-M, P643-M, P643-MG, P643-V, P653-M, P653-V.